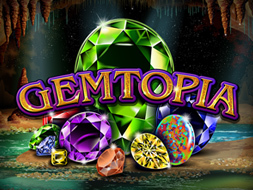 Gemtopia is a new online slot at Silversands Casino created by RTG (Real Time Gaming). This 5 reel, 10 paylines, progressive slot offers 2 bonus games and free spins, with a top fixed jackpot of 50 000. Go on a journey underground where it’s dark and all you can see is the glittery Gems shining from out the tunnel walls in the cave. Your job is to match them left to right or right to left to win a prize. The visuals and sounds offer a mysterious atmosphere and benefits from the 2 sparkling features. The wild re-spin and the free spins feature, while the wild re-spin feature expands to give you more winning opportunities, the free spins feature also gives you free games with instant prizes going up to 1000 times your bet. Plus if you are lucky enough to fill up the reels with the most valuable gems then you could end up winning 50 000 coins in 1 spin. Also the 2 progressive jack pots could be won at any point of the game. This has become a favorable game even though it was just released in August 2017. The reels look fabulous with all the gems and without the generic poker symbols. As soon as you have picked your bet you can immediately start spinning the reels or use the automatic spins to let it spin on its own and automatically stop at a winning or big prize. To win a prize you need to match at least 3 gems of a kind. There are 15 variable paylines which can be adjusted throughout the game.